I’m back from a yearly costume convention, Costume College (if you want to see pics there’s some on my flickr account)- and things are getting back to normal here. 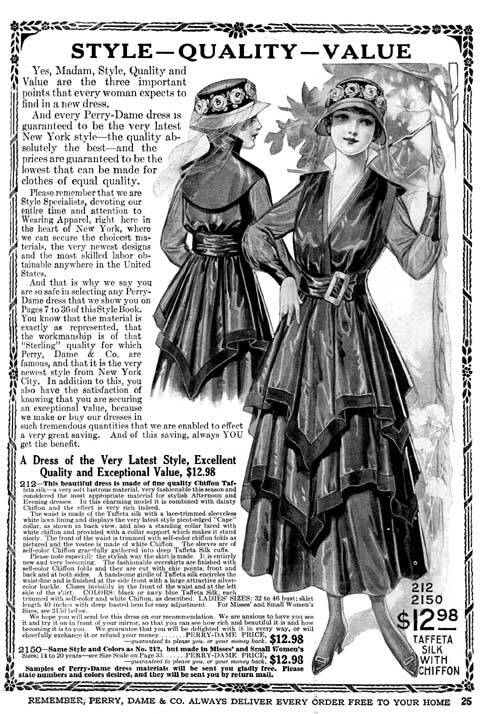 Here’s a few scans from a Perry, Dame, & Co catalog from Spring and Summer of 1916 that I thought you might enjoy! In pattern news, although I have a ton of ideas floating around in my head and halfway in the works for new patterns, I am back tracking a bit and attempting to grade a few of our patterns that are already out, including the Bathing Beauty Swimsuit and the 1940s Sailor Playsuit. It’s a slow process, but keep your eyes peeled for those in the coming months, and possibly a few new ones. It seems to be taking me about a month to issue each pattern (wish it was faster! ), so hopefully by the end of this month we’ll have one of those in the store. Hope you are all doing great and having a great week! >oooh, love these scans. Thanks for sharing!